After four years of working in a factory clocking 12-hour shifts, Madam Toh Lian Hoey, 53, decided she needed a change. She turned up at a heartland merchants' recruitment drive yesterday at Sengkang's Rivervale Mall, and found herself a new job as a retail assistant at homeware chain Japan Home. "I read about the job fair in the newspapers and decided to come down," said Madam Toh, who previously worked as a material handler in a Loyang factory. She begins work tomorrow, and her roles include manning the cash register and packing goods. "Now that I'm older, I want something less tiring and located near my home. I still want to work because I want to keep myself occupied," said the Punggol resident. The recruitment drive brought together nine employers with outlets in the neighbourhood, such as Prime Supermarket and Wang Cafe. 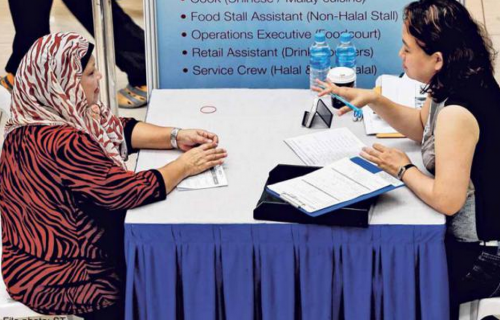 The firms set up booths at the first level of the mall for walk-in interviews. There were about 400 jobs on offer at the event, which was organised by North East Community Development Council (CDC) and the Singapore Workforce Development Authority. It was North East CDC's third time organising a recruitment drive for heartland merchants. It has also held such an event in Tampines Central and Hougang Central. Wang Cafe, which serves local fare such as kaya toast and laksa, had 102 available positions for service crew, food stall assistants and waiters. Its human resource manager Ng Bee Lin, 41, said the firm conducted at least 10 interviews yesterday, and one applicant was offered an immediate job as a service crew. "Recruitment fairs like this help us to reach out to residents who live around here, who may be shopping at the mall," she said. Deputy Prime Minister Teo Chee Hean, grassroots adviser and an MP for Pasir Ris-Punggol GRC, visited the fair. He said that he noticed residents from Tampines, Sengkang, Punggol and Pasir Ris gathering there, as they are interested in jobs close to home. "Some of them say they are in a different phase of life; they are looking for something closer to home which gives them a better work-life balance," he said.